WASHINGTON, DC, U.S.A., February 15, 2012: Jon Huntsman, Jr., a distinguished public servant who most recently was a candidate for President of the United States, has accepted an invitation to deliver the keynote address at the formal Opening Gala of the NPE2012 international plastics exposition, it was announced today by SPI: The Plastics Industry Trade Association, which produces the triennial NPE. Taking place in Orlando, Florida on the evening of Sunday, April 1, 2012, the Opening Gala will celebrate the 75th anniversary of SPI and the 50th anniversary of the Plastics Hall of Fame. Ten plastics industry leaders will be inducted into the Hall of Fame during the event. On the following day, April 2, the NPE2012 exhibit halls and conferences will open at the Orange County Convention Center in Orlando. Jon Huntsman, Jr., 51, has had a notable career in public service as well as with the global plastics and chemicals company founded by his father, Jon M. Huntsman, Sr. He has received appointments from four U.S. presidents and served as U.S. Ambassador to Singapore and China. He was twice elected governor of the state of Utah. 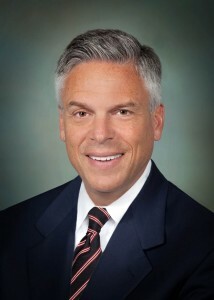 He has held leading positions in Huntsman Corporation since joining the family business in 1981 and is now a member of the board. He is a founding director of the Pacific Council on International Policy and has served in senior positions with the Brookings Institute Asia Policy Board, the Center for Strategic and International Studies Pacific Forum, the Asia Society in New York, and the National Bureau of Asian Research. He has lived in Asia at four periods in his life and speaks fluent Mandarin. Governor Huntsman’s father, Jon M. Huntsman, Sr., founded Huntsman Corporation in 1970. The company is a global manufacturer of chemicals, plastics, and other products, employing 12,000 people, with revenues of more than US $9-billion in 2010. The senior Mr. Huntsman was inducted into the Plastics Hall of Fame during NPE1994. The NPE2012 Opening Gala will be a formal event including a reception, banquet, Governor Huntsman’s keynote address, and the Plastics Hall of Fame induction ceremony. Tickets cost US $300 per person and $2,200 for a table of eight. The event will take place from 5:30 to 9:45 p.m. in the Sebastian J Ballroom of the Rosen Shingle Creek Hotel in Orlando. NPE2012 will take place Sunday through Thursday, April 1-5, 2012, at the Orange County Convention Center in Orlando, Florida. The exposition halls will be open April 2-5. A complete schedule of events can be found online at www.npe.org. NPE is solely owned and produced by the SPI: The Plastics Industry Trade Association.